As India and Australia prepare to embark on their first-ever bilateral naval interaction in the Bay of Bengal this month, reports suggest the exercises will focus on anti-submarine warfare (ASW). This is being seen as evidence of a growing regional consensus on the threat posed by Chinese undersea operations in the Asian littorals. Australia is reported to be sending a Lockheed Martin’s P-3 anti-submarine reconnaissance aircraft, a Collins-class submarine, and ASW frigates, while India will be deploying a P-8 long-range anti-submarine aircraft, along with other surface assets. Over the past two years, China’s submarine deployments in the Indian Ocean have been a source of worry for Indian analysts. Since May this year, when a Chinese Yuan-class submarine visited Karachi, there has been growing unease in New Delhi over the possibility of greater Chinese submarine presence in India’s maritime neighborhood. Indian analysts say the sudden rise in submarine visits suggests a larger game-plan for the expansion of the PLA-N’s operational footprint in the Indian Ocean. In the garb of anti-piracy operations, Chinese submarines have been performing specific stand-alone missions – a process, China skeptics contend, meant to lay the groundwork for a rotating but permanent deployment in the Indian Ocean Region (IOR). The pattern of recent PLA-N undersea deployments reveals a strategy to carve out controlled spaces in the Indian Ocean. Observers point to a Chinese Song-class visit to Colombo port in October last year, when the submarine docked at a harbor built and administered by a Chinese construction company. This was a violation of existing protocols which mandate that a foreign naval vessel dock in Sri Lanka Port Authority (SLPA) berths. Yet local authorities explained the anomaly by citing operational exigencies, almost as if they were under compulsion to accommodate Chinese submarines at an exclusive facility. At Karachi too, the PLA-N pulled of a clandestine one-week deployment that was revealed in the media weeks after it was completed. Significantly, Chinese maritime planners have been raising the complexity of the undersea missions. The Yuan-class deployment at Karachi signaled an improvement over the visit to Colombo, where the Song-class submarine needed the reassuring presence of a support vessel. Employing the Yuan-335-class – equipped with air-independent propulsion (AIP) and increased under-sea endurance – in latter missions suggests Beijing is now preparing to upgrade its submarine operations in the Indian Ocean. Accordingly, the PLA-N has been fine-tuning its standard operating procedures, gaining critical undersea experience, as well as securing vital hydrological and bathymetric data to maintain a sustained presence in the IOR. In the PLA-N’s new framework of operations, submarines are likely to play an increasingly vital role. Apart from defending tactical maritime space and gathering of critical intelligence, China’s submarines could evade detection and target Indian submarines in the Indian Ocean. More crucially, their presence could render India’s interdiction capabilities in the IOR redundant. Submerged in the depths of the Indian Ocean, PLA-N subs could evade comprehensive surveillance measures by India, facilitating hostile attacks on Indian shores. To drive home the point, Beijing has been deploying nuclear submarines (SSNs) to the Indian Ocean, presumably to highlight growing Chinese confidence in maintaining a standing presence in the Indian Ocean Region, and India’s inability to defend its strategic littorals. The defining shift in Chinese maritime strategy to a new “littoral” framework is best illustrated by the growing importance of the Yuan-class submarine in the PLA-N’s overseas operations. As a small, quiet, slow-moving anti-surface warfare platform, the Yuan plays a key role in littoral settings. Not only is it capable of traditional sub-surface killer (SSK) mission roles such as intelligence-gathering and coastal defense, its innovative design gives it an anti-ship cruise missile (ASCM) and land attack capability – an attribute deemed critical for the projection of combat power. From an Indian perspective, it is the evolving China-Pakistan nexus that raises the most anxiety. Since February 2013, when a Chinese company took-over management of the Gwadar port, Pakistan’s naval engagement with China has grown significantly. This includes regular bilateral and multilateral exercises, including growing PLA-N presence in the “Aman” series of exercises in the Western Indian Ocean. China has also been assisting Pakistan with its naval modernization program, including a proposed sale of eight Yuan-class submarines, four improved F-22P frigates, and six Type-022 Houbei stealth catamaran missile boats. These deals, Indian analysts point out, have the potential to wreak the sub-continent’s maritime balance. More importantly for India, Pakistan’s naval partnership with China could help extend the PLA-N’s operational reach beyond East Asia into what China calls the “far-seas.” Beyond facilitating regular missions – such as protecting the sea lines of communications, providing humanitarian assistance and disaster relief, and conducting naval diplomacy – the Pakistan navy could provide vital assistance to the PLA-N in projecting hard-power in the South Asian littorals. The rise in China’s near-coast submarine operations in the Indian Ocean, as well as a growing deployment of amphibious landing ships, certainly points to a propensity for greater maritime posturing in the IOR. India’s forthcoming naval interactions are, therefore, likely to focus on contingencies arising from greater Chinese naval presence in the Asian littorals. 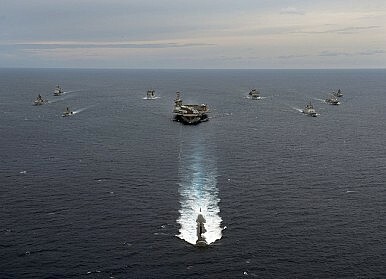 If media reports are to be believed, the India-U.S. Malabar naval exercises in the Bay of Bengal later this month will move beyond the traditional focus of humanitarian assistance and disaster relief operations to also include anti-air and anti-submarine warfare operations. New Delhi has also dropped its customary insistence for a bilateral template of operations in the Indian Ocean and extended an invitation to the Japanese navy to participate in the exercises. Meanwhile, Canberra has expressed its willingness to partner India, Japan and the U.S. in “quadrilateral” exchanges that emphasize a “rules-based” maritime order in the Asia-Pacific. As India and Australia reorient their maritime postures to cater to the new realities, there is a shared realization that strategic stability in maritime Asia can no longer be taken for granted. Both sides remain acutely aware that the preservation of maritime good order will require greater collective efforts by regional navies. The forthcoming exercises need to be seen as part of a broader regional attempt to preserve the balance of maritime power in the wider Indo-Pacific region.